Store in a cool and dry place. Keep in an airtight container and use within 1 week after opening. 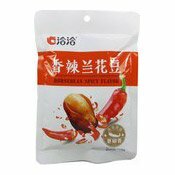 Ingredients: Broad Bean, Plant Oil, Spicy Flavour (Chilli Powder, White Granulated Sugar, Salt, Monosodium Glutamate, Pepper Powder, Garlic Powder, Onion Powder, Tomato Powder, Pepper Powder, Spices, Edible Flavour, Soya Sauce Powder (Soya Sauce, Malt Dextrin, Salt, Glycine, Disodium Succinate, Disodium 5'-Flavour Nucleotides, Citric Acid, Acesulfame-K), Yeast Extract, Malt Extract (Barley, Brewers Malt, Water), Citric Acid, Disodium 5'-Flavour Nucleotides, Aspartame (Phenyl Alanine), Salt, Food Additives (Sodium Glutamate, Trimeric Sodium Phosphate, Sodium Hexametaphosphate, Acesulfame, Sodium Cyclamate, Sodium Bicarbonate, Ditert-Butylhydro Quinone). Simply enter your details below and we will send you an e-mail when “Broad Bean Snack (Spicy Flavour) (辣味花豆)” is back in stock!